Afternoon Tea is quintessentially British. I’m not sure why I enjoy nibbling on finger sandwiches, scones and tiny cakes. Perhaps it’s the fact that everyone partaking in the Afternoon Tea also has the same thing as you, and thus it shares some of the same things I love about sharing food. Maybe it’s the idea that it was enjoyed by the upper class and thus one can, for a moment, feel like they are living that life. In any case, Manchester has no shortage of places to have Afternoon Tea and the Midlands is one of the older settings, based inside a Grade II listed building built in 1903. Let’s see what the Midlands has to offer. The building which houses the Midland Hotel was built by the Midland Railway company so that guests may use it when they are travelling to and from the old Manchester Central railway station. The hotel used to house a 1000 seat theatre too! The building was designed in the Baroque style by Charles Trubshaw, who also designed many other railway stations across the UK, including Leicester and Sheffield. It was voted 2nd favourite building by readers of the Manchester Evening News in 2012 (beaten only by the Town Hall). The new Tea Room opened in Spring 2017 in the old Wyvern room, facing St. Peter’s Square. It is a dedicated space for Afternoon Tea, with the hotel serving its ten different teas and china which you can purchase. 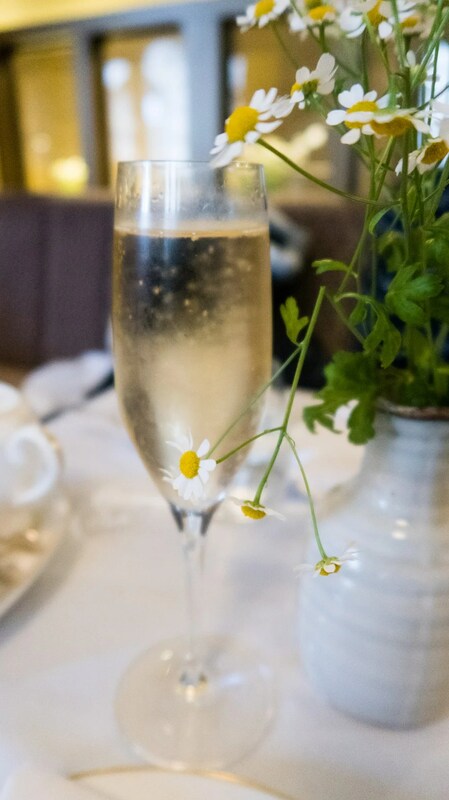 There are vegetarian, vegan and gluten-free options available priced at £27 each or £34 served with a glass of champagne. I booked ahead for my Royal Afternoon Tea and made them aware that I was not consuming red meat (due to sustainability reasons). They were more than happy to cater to this requirement, so I was able to choose an alternative from their other menus. I replaced one beef sandwich for one containing aubergine from the vegan menu. The champagne served was a Montaudon Cuvée Brut which had notes of almond and brioche toast, combined with crisp green apple and lime accents. This complimented the afternoon tea well as the flavour profiles are similar. As mentioned, there are ten tea blends so there’s bound to be one that tickles your taste buds. What’s even better is that you can try another tea if you wanted to, so you are not stuck with your first choice. 1903 – The Midland: A deep malty tea with Assam and Indonesian leaves. This pays homage to the founding of the Midland Hotel. Midland Jubilee: A light and fragrant Indian black tea with strawberries and nougat. Due North: The blend is a smokey Lapsang Souchong with a touch of whisky. Inspired by the gentlemen who used to travel on the railway. Imperial Earl Grey: Black and milky oolong scented with premium Italian bergamot oil. Garden of Eden: A black and green tea blended with roses, blue cornflowers and and Japanese peach. Inspired by Blenheim Palace’s Pleasure Gardens and Butterfly House. Green Flamingo: Gunpowder green tea combined with rose and Brazilian graviola (a fruit). White Elixir: A white tea blended with jasmine petals, gingko leaves and spirulina (an algae). Tales of the Orient: An infusion of rooibos, lemongrass, mango, chilli and lime. Caffeine free. British Mint and Caramel: Peppermint tea blended with caramel. Caffeine free. Cleanse: Chai with cardamom, ginger and pepper blended with dates and cacao beans. I tried the Cleanse, then moved to the Garden of Eden. Between these, I prefer the former as I love the mix of spices and cacao. The Garden of Eden has a nice floral note worth trying if you like the taste of rose. 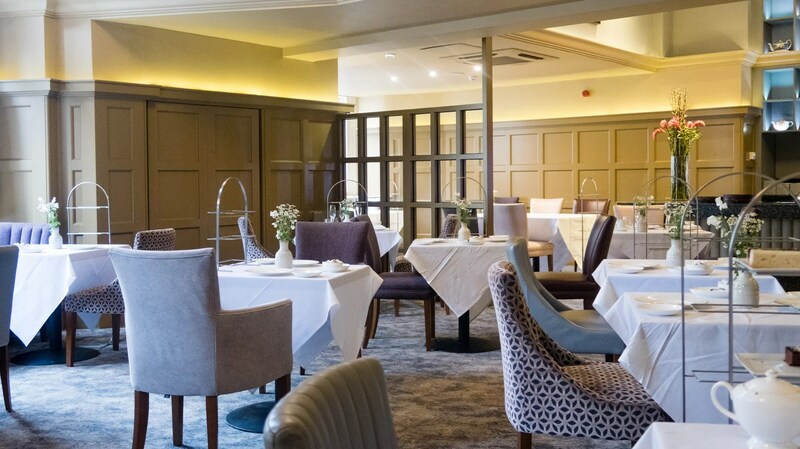 As the Tea Room is made specifically to serve Afternoon Tea, each table already has a stand placed next to it, at the same height as the table. This means that precious table space is not wasted. The plates are brought to the stand by staff once they are all ready. I love the fact that these were proper finger sandwiches, just like tradition dictated. They were very neatly crafted and arranged, but I thought the bread was a bit stale for some of them. I also inherently disapproved of the naming of the aubergine sandwich as a banh mi, as a traditional banh mi is always in a baguette. The flavours of all the sandwiches were good, though. I admit I only managed to eat the Valrhona delice sat down as I was too full to consume the rest. This was a little less impressive than I expected, but this might also be because I was stuffing myself by this stage. I did take the rest home, but they didn’t quite survive the journey intact and I fear this might have affected the taste. This was particulary the case with the panna cotta, where the ginger bread base slid off and was soggier than anticipated. Each person also had two scones each, one fruit and one plain. This was, of course, served with Devon clotted cream and a selection Mrs Darlington’s Jams; the latter is served by your waiter/waitress when you are ready. Our options were raspberry jam, strawberry jam and lemon curd. As for which way round I put the cream and jam on the scones, well that is a debate. I’m a fan of the Devon way, mostly because in a lot of situations the consistency of the cream can be very dense and stiff. This results in a very messy looking scone as I try to plop or spread the cream and it just ends up moving the jam around in a Jackson Pollock fashion. At least by putting the cream first, you can be as messy as you’d like. As the jam is usually of a good consistency, you end up with a much neater looking scone. 7.5/10, -1 for the stale bread, -0.5 for using the term “banh mi” to describe a finger sandwich, -1 for the underwhelming cakes, although I do acknowledge my experience could be due to other factors. I cannot repeat how lovely and attentive the staff at the Midland Tea Room are throughout the experience. The setting is lovely with a rich history and many dietary requirements are catered for. The afternoon tea would make a lovely gift to someone. It’s definitely an option for Afternoon Tea if you prefer a classy setting. Having said that, I doubt I’d be back soon since it isn’t something you’d have often.